Elizabeth Ann Warren (née Herring; born June 22, 1949) is an American academic and politician, who is the senior United States Senator from Massachusetts. She is a member of the Democratic Party, and was previously a Harvard Law School professor specializing in bankruptcy law. A prominent legal scholar, Warren is among the most cited in the field of commercial law. She is an active consumer protection advocate whose scholarship led to the conception and establishment of the U.S. Consumer Financial Protection Bureau. Warren has written a number of academic and popular works, and is a frequent subject of media interviews regarding the American economy and personal finance. Following the Assistant to the President and Special Advisor to the Secretary of the Treasury for the Consumer Financial Protection Bureau under President Barack Obama. During the late 2000s, she was recognized by publications such as the National Law Journal and the Time 100 as an increasingly influential public policy figure. In September 2011, Warren announced her candidacy for the U.S. Senate, challenging Republican incumbent Scott Brown. She won the general election on November 6, 2012, becoming the first female Senator from Massachusetts. She was assigned to the Senate Special Committee on Aging; the Banking, Housing, and Urban Affairs Committee; and the Health, Education, Labor, and Pensions Committee. Warren has been described as a leading figure in the Democratic Party and among American progressives and has frequently been mentioned by political pundits as a potential 2016 presidential candidate. However, Warren has repeatedly stated that she has no intention of running for President in 2016. Warren was born on June 22, 1949, in Oklahoma City, Oklahoma, to working class parents Pauline (née Reed) and Donald Jones Herring. She was their fourth child, with three older brothers. When she was twelve, her father, a janitor, had a heart attack—which led to many medical bills, as well as a pay cut because he could not do his previous work. Eventually, this led to the loss of their car from failure to make loan payments. To help the family finances, her mother found work in the catalog-order department at Sears and Elizabeth began working as a waitress at her aunt's restaurant. Lizza, Ryan (May 4, 2015). "The virtual candidate : Elizabeth Warren isn't running, but she's Hillary Clinton's biggest Democratic threat". Profiles. ^ Ebbert/Levenson, Stephanie/Michael (August 18, 2012). "For Professor Warren, a steep climb". ^ Dennis, Brady (August 13, 2010). "Elizabeth Warren, likely to head new consumer agency, provokes strong feelings". ^ a b "Law School Faculty Member Profile: Elizabeth Warren". ^ "Group boosting Elizabeth Warren widening rifts in Democratic Party — Politics". The Boston Globe. 2013-12-16. Retrieved 2014-08-09. ^ "It's Elizabeth Warren's Party. Barack Obama Is Just Living in It.". NationalJournal.com. Retrieved 2014-08-09. ^ a b Scheiber, Noam (2013-11-10). "Elizabeth Warren is Hillary Clinton's Nightmare". New Republic. Retrieved 2014-08-09. ^ a b Blake, Aaron. "Why Elizabeth Warren is perfectly positioned for 2016 (if she wanted to run)". The Washington Post. Retrieved 2014-08-09. ^ a b Eun Kyung Kim (March 31, 2015). "'"Elizabeth Warren on 2016: 'I'm not going to run' — and Hillary Clinton deserves 'a chance to decide. Today News. Retrieved April 4, 2015. ^ "10 Things You Didn't Know About Elizabeth Warren". US News and World Report. usnews.com. October 4, 2010. Retrieved July 26, 2011. ^ "Ancestors of: Herring, Elizabeth" (PDF). North Shore Journal. May 2012. Retrieved 2012-06-10. ^ Noah Bierman (2012-02-12). "A girl who soared, but longed to belong — Page 2 - Boston.com". Articles.boston.com. Retrieved 2012-06-09. ^ a b c Andrews, Suzanna (November 2011). "The Woman Who Knew Too Much". ^ a b c Packer, George (2013). The Unwinding, an inner history of the New America. New York: Farrar, Straus, and giroux. p. 346. ^ Packer, George (2013). The Unwinding, an inner history of the New America. New York: Farrar, Straus, and giroux. ^ a b c Packer, George (2013). The Unwinding, an inner history of the New America. New York: Farrar, Straus, and giroux. p. 345. ^ a b "Warren Winning Means No Sale If You Can't Explain It". ^ Charles P. Pierce, "The Watchdog: Elizabeth Warren," The Boston Globe Sunday Magazine, December 20, 2009. Retrieved March 9, 2015. ^ "Educators endorse Elizabeth Warren for the U.S. Senate". massteacher.org. Massachusetts Teachers Association. Retrieved September 19, 2012. ^ a b Kim, Mallie Jane (October 4, 2010). "10 Things You Didn't Know About Elizabeth Warren". ^ Lee, MJ (April 16, 2014). "Elizabeth Warren: ‘I was hurt, and I was angry’". ^ a b Neyfakh, Leon (October 22, 2011). "Elizabeth Warren's unorthodox career". Boston Globe. Retrieved February 22, 2015. ^ Pooja Nair (2014). "Insights from Professor Warren: Analyzing Elizabeth Warren's Academic Career". http://www.bna.com/. Bloomberg Law. Retrieved February 24, 2015. ^ Sahadi, Jeanne "The new bankruptcy law and you". CNNMoney.com, October 17, 2005. Retrieved on April 12, 2007. ^ "Advisory Committee on Economic Inclusion (ComE-IN)". .
^ "Committees". National Bankruptcy Conference. ^ "Elizabeth Warren on Charlie Rose". May 11, 2009. "Elizabeth Warren on Charlie Rose". March 4, 2010. ^ Kantor, Jodi (March 25, 2010). "Behind Consumer Agency Idea, a Tireless Advocate". ^ "President Obama Names Elizabeth Warren Assistant to the President and Special Advisor to the Secretary of the Treasury on the Consumer Financial Protection Bureau". www.WhiteHouse.gov. Retrieved December 17, 2014. ^ a b Katharine K. Seelye, A New Senator, Known Nationally and Sometimes Feared The New York Times November 10, 2012. ^ Cooper, Helene (2012-01-04). 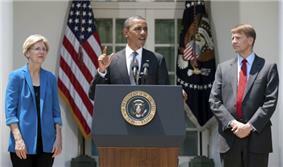 "Defying Republicans, Obama to Name Cordray as Consumer Agency Chief". The New York Times. Retrieved 2012-06-09. ^ Randall, Maya Jackson (September 14, 2011). "Warren Kicks Off Senate Campaign". ^ Helderman, Rosalind S.; Weiner, Rachel (September 14, 2011). "Consumer advocate Elizabeth Warren launches US Senate campaign with tour of Massachusetts". ^ Sargent, Greg (September 21, 2011). "Class warfare, Elizabeth Warren style". ^ Smerconish, Michael (July 30, 2012). "'"The context behind Obama's 'you didn't build that. Philadelphia Inquirer. Retrieved August 23, 2012. ^ Kathleen Hennessey (July 18, 2012). "Republicans pouncing on Obama's 'you didn't build that' remark". ^ Bierman, Noah (May 30, 2012). "Deval Patrick endorses Elizabeth Warren for US Senate". Boston.com. ^ "Elizabeth Warren agrees to WBZ-TV debate with Scott Brown — Political Intelligence — A national political and campaign blog from The Boston Globe". Boston.com. June 5, 2012. Archived from the original on June 7, 2012. Retrieved 2012-06-09. ^ Noah Bierman, US Chamber calls Elizabeth Warren threat to free enterprise The Boston Globe August 15, 2012. ^ "'"Elizabeth Warren: 'The System Is Rigged. ABC News. Retrieved October 12, 2014. ^ "'"Elizabeth Warren: 'Wall Street CEOs' Still 'Strut Around Congress. Political Capital. Retrieved October 12, 2014. ^ Kirchgaessner, Stephanie (September 6, 2012). "'"Warren attacks CEOs who 'wrecked economy. Financial Times. Archived from the original on September 8, 2012. ^ a b Chabot, Hillary (2012-04-27). "Harvard trips on roots of Elizabeth Warren's family tree". BostonHerald.com. Retrieved 2012-06-09. ^ a b Carmichael, Mary (2012-05-25). "Filings raise more questions on Warren's ethnic claims". Boston Globe. Archived from the original on May 25, 2012. Retrieved 2012-06-09. ^ Nickisch, Curt. "Despite Pledge, Gloves Are Off In Massachusetts Senate Race". http://www.wbur.org/. WBUR News. Retrieved February 23, 2015. ^ a b c Hicks, Josh (2012-09-28). "Everything you need to know about Elizabeth Warren's claim of Native American heritage". Washington Post. Retrieved 7 Jan 2013. ^ Chabot, Hillary (2012-05-02). "Warren: I used minority listing to share heritage". BostonHerald.com. Archived from the original on 2012-05-03. Retrieved 2012-06-09. ^ Jacobs, Sally (September 16, 2012). "Elizabeth Warren's family has mixed memories about heritage". Boston Globe. Retrieved January 9, 2013. ^ MJ Lee (April 18, 2014), "Elizabeth Warren: 'I was hurt, and I was angry'", The Politico. ^ Franke-Ruta, Garance (May 20, 2012). "Is Elizabeth Warren Native American or What?". The Atlantic. Retrieved 25 October 2015. ^ Bierman, Noah, and Phillips, Frank (November 7, 2012). "Elizabeth Warren defeats Scott Brown". Boston Globe. Retrieved April 27, 2014. ^ Thys, F. (January 4, 2013). "Elizabeth Warren Sworn In As First Female Senator From Mass.". 90.9 wubr. Retrieved May 18, 2013. ^ Stephen Webster (March 7, 2013). "Warren: Drug possession warrants jail time but laundering cartel money doesn't?". ^ Chumley, Cheryl K. (March 18, 2013). "Take it to the bank: Sen. Elizabeth Warren wants to raise minimum wage to $22 per hour". ^ Wing, Nick (March 18, 2013). "Elizabeth Warren: Minimum Wage Would Be $22 An Hour If It Had Kept Up With Productivity". ^ Erika Eichelberger (May 14, 2013). "Elizabeth Warren to Obama Administration: Take the Banks to Court, Already!". ^ Webley, K. (May 10, 2013). "Elizabeth Warren: Students Should Get the Same Rate as the Bankers". TIME Magazine. Retrieved May 11, 2013. ^ Drum, Kevin (November 13, 2014) - "Elizabeth Warren Gets a Promotion -- Or Does She?". Mother Jones. Retrieved December 4, 2014. ^ Terkel, Amanda & Grim, Ryan (November 13, 2014) - "Elizabeth Warren Gets Senate Democratic Leadership Spot". Huffington Post. Retrieved December 4, 2014. ^ S.A. Miller (November 13, 2014) - "New chief: Senate Democrats Anoint Elizabeth Warren to Leadership Post". The Washington Times. Retrieved December 4, 2014. 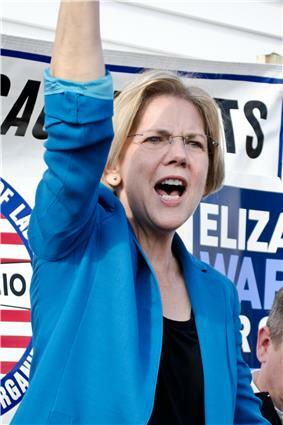 ^ Berman, Russell (November 13, 2014) - "Elevating Elizabeth Warren". The Atlantic. Retrieved December 4, 2014. ^ "Senators Warren, McCain, Cantwell and King Introduce 21st Century Glass- Steagall Act". Elizabeth Warren U.S. Senator for Massachusetts. 7 July 2015. Retrieved 27 July 2015. ^ Is Elizabeth Warren really truly not running for president? ^ Why Isn't Elizabeth Warren Running for President? ^ Wesley Lowery (April 27, 2014). "Elizabeth Warren: I hope Hillary Clinton runs for president". The Washington Post. Retrieved April 4, 2015. ^ a b "Who's left? The top 20 US progressives," January 11, 2012"New Statesman". Retrieved October 12, 2014. ^ "Women's Bar Association Announces Opening of Nominations for Lelia J. Robinson Awards". ^ "Featured Profile: Elizabeth Warren". ^ "Elizabeth Warren Bio" (PDF). ^ Capizzi, Carla (May 10, 2011). "Legal Scholar Elizabeth Warren, Historian Annette Gordon-Reed, Entrepreneur Marc Berson to Address Graduates of Rutgers University, Newark". ^ Warren, Elizabeth; Amelia Warren Tyagi (2005). All Your Worth: The Ultimate Lifetime Money Plan. Free Press. pp. 1–12. ^ Madrick, Jeff (September 4, 2003). "Necessities, not luxuries, are driving Americans into debt, a new book says". ^ Himmelstein, David U.; Warren, Elizabeth; Deborah, Deborah; Woolhandler, Steffie J. (2005-02-08). "Illness and Injury as Contributors to Bankruptcy". SSRN Electronic Journal (Social Science Research Network). ^ Warren, Elizabeth (2005-02-09). "Sick and Broke". The Washington Post. p. A23. ^ Langer, Gary (March 5, 2009). "Medical Bankruptcies: A Data-Check". The Numbers blog. Warren, E. (1987). "Bankruptcy Policy". The University of Chicago Law Review 54 (3): 775–814. Warren, E. (1992). "The Untenable Case for Repeal of Chapter 11". The Yale Law Journal 102 (2): 437–479. Warren, E. (1993). "Bankruptcy Policymaking in an Imperfect World". Michigan Law Review 92 (2): 336–387. "Principled Approach to Consumer Bankruptcy". American Bankruptcy Law Journal (Heinonline.org) 71: 483. 1997. Warren, Elizabeth; Westbrook, Jay Lawrence (January 2000). "Financial Characteristics of Businesses in Bankruptcy". SSRN Electronic Journal 73: 499. Himmelstein, DU; Warren, E; Thorne, D; Woolhandler, S (2005). "Illness and injury as contributors to bankruptcy". Health affairs (Project Hope). Suppl Web Exclusives: W5–63–W5–73. "The Vanishing Middle Class". In Edwards, John, ed. (2007). Ending Poverty in America: How to Restore the American Dream. Himmelstein, David U.; Warren, Elizabeth; Thorne, Deborah; Woolhandler, Steffie J. (2005). "Illness and Injury as Contributors to Bankruptcy". SSRN Electronic Journal. Himmelstein, DU; Thorne, D; Warren, E; Woolhandler, S (2009). "Medical bankruptcy in the United States, 2007: Results of a national study". The American Journal of Medicine 122 (8): 741–6. Chapter 11: Reorganizing American Businesses (Essentials). Aspen Publishers. 2008. A Fighting Chance. Metropolitan Books. 2014. Warren's book A Fighting Chance was published by Metropolitan Books in April 2014. According to a review published in The Boston Globe, "[t]he book's title refers to a time she says is now gone, when even families of modest means who worked hard and played by the rules had at a fair shot at the American dream." In 2009, Warren became the first professor in Harvard's history to win the law school's The Sacks–Freund Teaching Award for a second time. In 2011, she delivered the commencement address at the Rutgers School of Law–Newark, where she was awarded an honorary Doctor of Laws degree and was conferred membership in the Order of the Coif. In 2009, the Boston Globe named her the Bostonian of the Year, and the Women's Bar Association of Massachusetts honored her with the Lelia J. Robinson Award. She was named one of Time Magazine's 100 Most Influential People in the World in 2009, 2010 and 2015. The National Law Journal repeatedly has named Warren as one of the Fifty Most Influential Women Attorneys in America, and in 2010 it honored her as one of the 40 most influential attorneys of the decade. In 2011, Elizabeth Warren was inducted into the Oklahoma Hall of Fame. 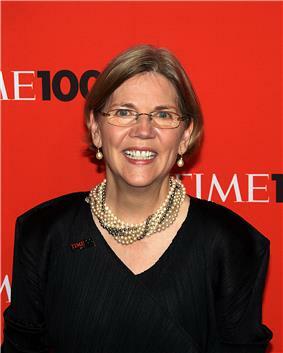 In January 2012, Warren was named a "Top-20 U.S. Progressive" by the New Statesman, a magazine based in the United Kingdom. 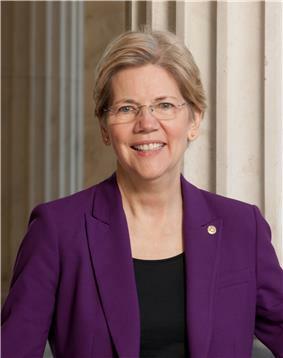 In the run-up to the 2016 US presidential election, Warren's name has been put forward by liberal Democrats as a possible presidential candidate. However, Warren has repeatedly stated that she is not running for President in 2016. She has instead urged Hillary Clinton to run. In October 2013, she joined with the other fifteen Senate Democratic women in signing a letter that encouraged Clinton to run. Saying, "despite the progress we've made since 2008, the biggest banks continue to threaten our economy," in July 2015 Senator Warren, along with John McCain (R-AZ), Maria Cantwell (D-WA), and Angus King (I-ME) re-introduced the 21st Century Glass-Steagall Act, a modern version of the Banking Act of 1933. The legislation is intended to reduce the risk for the American taxpayer in the financial system and decrease the likelihood of a future financial crises. During the 2014 election cycle, Warren was a top Democratic fundraiser, supporting candidates in Ohio, Minnesota, Oregon, Washington, West Virginia, Michigan, and Kentucky. In the aftermath of the election, Warren was appointed by Majority Leader Harry Reid (the same man who made her chair of the Congressional Oversight Panel) to become the first-ever Strategic Advisor of the Democratic Policy and Communications Committee, a position that was created just for her. The move is widely seen as an effort by Reid to lean his party more to the left following major Democratic losses in the recent election. It would also end up boosting further speculation about a possible presidential run by Warren in 2016. In May, Warren sent letters to  Endorsing her bill days after its introduction, Independent Senator from Vermont Bernie Sanders stated: "The only thing wrong with this bill is that [she] thought of it and I didn't" on The Thom Hartmann Program. Warren is in favor of increasing the minimum wage and has argued that if the minimum wage had followed increases in worker productivity in the United States, it would now be at least $22 an hour. At Warren's first Banking Committee hearing on February 14, 2013, she pressed several banking regulators to answer when they had last taken a Wall Street bank to trial and stated, "I'm really concerned that 'too big to fail' has become 'too big for trial'." Videos of Warren's questioning became popular on the internet, amassing more than 1 million views in a matter of days. At a Banking Committee hearing in March, Warren questioned Treasury Department officials why criminal charges were not brought against HSBC for its money laundering practices. With her questions being continually dodged and her visibly upset, Warren then compared money laundering to drug possession, saying: "If you're caught with an ounce of cocaine, the chances are good you're going to go to jail... But evidently, if you launder nearly a billion dollars for drug cartels and violate our international sanctions, your company pays a fine and you go home and sleep in your own bed at night." On November 6, 2012, Warren defeated incumbent Scott Brown with a total of 53.7% of the votes. She is the first woman ever elected to the U.S. Senate from Massachusetts, as part of a sitting U.S. Senate that has 20 female senators currently in office, the largest female U.S. Senate delegation in history, following the November 2012 elections. In December 2012, Warren was assigned a seat on the Senate Banking Committee, the committee that oversees the implementation of Dodd–Frank and other regulation of the banking industry. 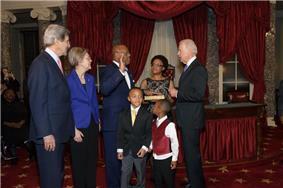 Warren was sworn in by Vice President Joe Biden on January 3, 2013. Upon John Kerry's resignation to become United States Secretary of State, Warren became the state's senior senator after having served for less than a month, making her the most junior senior senator in the 113th Congress. In April 2012, the Boston Herald sparked a campaign controversy when it reported that from 1986 to 1995 Warren had listed herself as a minority in the Association of American Law Schools (AALS) directories. Harvard Law School had publicized her minority status in response to criticisms about a lack of faculty diversity, but Warren said that she was unaware of this until she read about it in a newspaper during the 2012 election. Scott Brown, her Republican opponent in the Senate race, speculated that she had fabricated Native American heritage to gain advantage in the employment market. Former colleagues and supervisors at universities she had worked at stated that Warren's ancestry played no role in her hiring. Warren responded to the allegations saying that she had self-identified as a minority in the directories in order to meet others with similar tribal roots. Her brothers defended her, stating that they "grew up listening to our mother and grandmother and other relatives talk about our family's Cherokee and Delaware heritage". In her 2014 autobiography, Warren described the allegations as untrue and hurtful. The New England Historic Genealogical Society found a family newsletter that alluded to a marriage license application that listed Elizabeth Warren’s great-great-great grandmother as a Cherokee, but could not find the primary document and found no proof of her descent. The Oklahoma Historical Society said that finding a definitive answer about Native American heritage can be difficult because of intermarriage and deliberate avoidance of registration. Warren received a primetime speaking slot at the 2012 Democratic National Convention, immediately before Bill Clinton, on the evening of September 5, 2012. Warren positioned herself as a champion of a beleaguered middle class that "has been chipped, squeezed, and hammered." According to Warren, "People feel like the system is rigged against them. And here's the painful part: They're right. The system is rigged." Warren said that Wall Street CEOs "wrecked our economy and destroyed millions of jobs" and that they "still strut around congress, no shame, demanding favors, and acting like we should thank them." Warren encountered significant opposition from business interests. In August 2012, Rob Engstrom, political director for the United States Chamber of Commerce, claimed that "no other candidate in 2012 represents a greater threat to free enterprise than Professor Warren." She nonetheless raised $39 million for her campaign, the most of any Senate candidate in 2012. Warren ran unopposed for the Democratic nomination and won it on June 2, 2012, at the state Democratic convention with a record 95.77% of the votes of delegates. She was endorsed by the Governor of Massachusetts, Deval Patrick. Warren and her opponent Scott Brown agreed to engage in four televised debates, including one with a consortium of media outlets in Springfield and one on WBZ-TV in Boston. On November 14, 2008, Warren was appointed by United States Senate Majority Leader Harry Reid to chair the five-member Congressional Oversight Panel created to oversee the implementation of the Emergency Economic Stabilization Act. The Panel released monthly oversight reports that evaluate the government bailout and related programs. During Warren's tenure, these reports covered foreclosure mitigation, consumer and small business lending, commercial real estate, AIG, bank stress tests, the impact of the Troubled Asset Relief Program (TARP) on the financial markets, government guarantees, the automotive industry, and other topics. Warren joined the University of Pennsylvania Law School as a full professor in 1987 and obtained an endowed chair in 1990 (becoming William A Schnader Professor of Commercial Law). She taught for a year at Harvard Law School in 1992 as Robert Braucher Visiting Professor of Commercial Law. In 1995, Warren left Pennsylvania to become Leo Gottlieb Professor of Law at Harvard Law School. As of 2011, she was the only tenured law professor at Harvard who was trained at an American public university. At Harvard, Warren became one of the most highly cited law professors in the United States. Although she had published in many fields, her expertise was in bankruptcy. In the field of bankruptcy and commercial law, only Douglas Baird of Chicago, Alan Schwartz of Yale, and Bob Scott of Columbia have citation rates comparable to that of Warren. Warren's scholarship and public advocacy were the impetus behind the establishment of the U.S. Consumer Financial Protection Bureau. Warren started her academic career at Rutgers School of Law–Newark (1977–78). She moved to the University of Houston Law Center (1978–83), where she became Associate Dean for Academic Affairs in 1980, and obtained tenure in 1981. She taught at the University of Texas School of Law as visiting associate professor in 1981, and returned as a full professor two years later (1983–87). In addition, she was a visiting professor at the University of Michigan (1985) and research associate at the Population Research Center of the University of Texas at Austin (1983–87). Early in her career, Warren became a proponent of on-the-ground research based on studying how people actually respond to laws in the real world. Her work analyzing court records and interviewing judges, lawyers, and debtors established her as a rising star in the field of bankruptcy law. Warren voted as a Republican for many years, saying, "I was a Republican because I thought that those were the people who best supported markets". She states that in 1995 she began to vote Democratic because she no longer believed that to be true, but she says that she has voted for both parties because she believed that neither party should dominate. After having two children, Amelia and Alexander, she and Jim Warren divorced in 1978. In 1980, Warren married Bruce Mann, a Harvard law professor, but retained the surname Warren to try to make things easier for her children. Warren and her husband moved for his work to New Jersey, where, after becoming pregnant, she decided to remain at home to care for their child. After their daughter turned two, Warren enrolled at the Rutgers School of Law–Newark. She worked as a summer associate at Cadwalader, Wickersham & Taft. Shortly before her graduation in 1976, Warren became pregnant with their second child. After graduating and passing the bar examination, she began to work as a lawyer from home, writing wills and doing real estate closings. She moved to Houston with her husband, who was a NASA engineer. There she enrolled in the University of Houston, graduating in 1970 with a bachelor of science degree in speech pathology and audiology. For a year, she taught children with disabilities in a public school, based on an "emergency certificate", as she had not taken the education courses required for a regular teaching certificate. Initially aspiring to be a teacher, she left GWU after two years to marry her high-school boyfriend, Jim Warren.